The day after I published my post about Soda, Fast Food, and Fitness, the Center For Science in the Public Interest released a report titled Selfish Giving: How the Soda Industry Uses Philanthropy to Sweeten its Profits. It covered some familiar territory including the problems with the Academy of Nutrition and Dietetics being sponsored by Coke and Pepsi (pg 5-6). I’ve compared this to the American Medical Society being sponsored by cigarette companies in Tobacco flashbacks: Coke and Pepsi Sponsor Academy of Nutrition and Dietetics. That comparison seems even more apt with the new Harvard study linking soda to 180,000 deaths per year. Selfish Giving also touched on the reason so many organizations justify accepting money from the soda companies (pg 13). Maya Rockeymore, President and CEO of Global Policy Solutions, addressed the dilemma this way (pg 27). Do we love the products more than we love our children-who are projected to be the first generation to live sicker and shorter lives than their parents because of obesity and related illnesses?…we need to develop a different relationship-one that goes beyond cultural pride and financial support to a relationship that fundamentally respects the value of human life. Tough economic times means organizations have an even harder time finding funding but it also means people are even more vulnerable to food insecurity and the related risk for obesity. Writer Raj Patel coined the term “stuffed and starved” to highlight this phenomenon. Simply put, if the only food you can afford to eat doesn’t have what you need to be healthy, and it doesn’t fill you up, you’re likely to keep eating to feel satisfied. This perpetuates the “stuffed and starved” cycle. 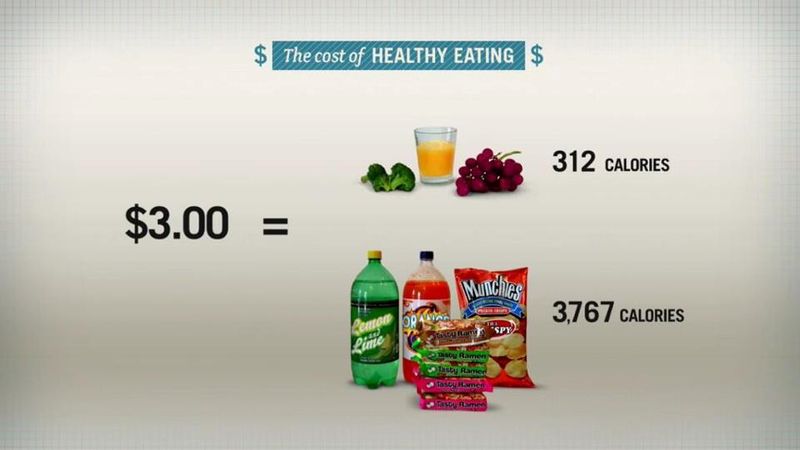 Looking at this “Cost of Healthy Eating” picture from the film, A Place at the Table, is it any wonder so many kids are overfed yet undernourished? My favorite part of the report was Appendix C: Excerpt from “Model Guidelines for Nonprofits Evaluating Proposed Relationships with Other Organizations” (pg 33). The full guidelines can be found at Tobacco Free Kids. Here are some of the important questions organizations should ask before accepting a sponsorship. A nonprofit’s reputation for integrity, credibility, social responsibility and accountability is its greatest asset. Does the proposed activity and/or the proposed relationship promote the mission and values of our organization? Will the relationship promote or enhance activities or organizations whose goals are inconsistent with the mission and values of our organization? Will the relationship maintain our organization’s reputation for objectivity, independence, integrity, credibility, social responsibility and accountability? Is the proposed partner one with which we would be proud to be publicly associated? Does the proposed partner share our mission and values? Can we stand behind the products, services and positions taken by the partner? Why does the partner want to work with us? Does the proposed partner hope to use our organization’s name or its relationship with us to advance its public image, public policy agenda, or its marketing? Does the proposed partner expect that a relationship with us will help secure our support or our silence on activities or issues on which we do not agree? This is a strategy sometimes used by corporations attempting implicitly to “buy the silence” of potential critics. Is our independence, objectivity and credibility fully protected, in fact and in public appearance? Are negative consequences foreseeable from this relationship? How will this relationship affect other relationships of value to us? Will it affect our image, reputation, credibility, ability to raise funds or other important assets? Would we be comfortable if the details of this relationship appeared on the front page of a major newspaper? I hope more organizations will ask these tough questions and reconsider taking sponsorship money from the soda industry. I encourage you to read the full report for yourself and let me know your thoughts on it. Tags: AND, CSPI, soda. Bookmark the permalink.